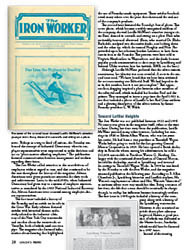 The history of the Iron Worker is thoroughly intertwined with the histories of the McWane family and the Lynchburg Foundry. Shortly after the Civil War, Charles P. McWane, a millwright who had been taught the trade by his father, opened a shop in Wytheville to make plows and other farm implements. Charles taught his son Henry the trade, and when Henry was about twenty, the two men formed a partnership called C. P. McWane & Co. Henry did the bookkeeping and ran the office for the business, which had ten employees. In 1887 Henry was recruited by the Glamorgan Company in Lynchburg to be plant manager. Within two years he moved the operation into cast-iron pipe production and by 1892 was president of the company. In 1896 he helped his brother James establish a new plow factory, and in 1902 he left Glamorgan to become associated with the Lynchburg Plow Works. He reorganized the Plow Works as the Lynchburg Plow and Foundry Co. and began making pipe. (This was in the days before contracts had noncompete clauses.) In 1905 the company bought the Radford Pipe and Foundry Company and became the Lynchburg Foundry Company. Henry hired his nineteen-year-old son, Lawrence, as bookkeeper. Henry died by his own hand in 1914, and the presidency of the growing company passed to Lawrence. 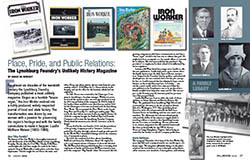 Lawrence guided the Foundry through a phase of rapid growth spurred by the World War I demand for fittings used in the construction of ammunition plants. James W. Wright is a graduate of E. C. Glass High School and the University of Virginia (BA and MD). He formerly practiced medicine in Lynchburg and is currently employed in the Medical Department at Genworth Financial. He serves on the boards of the Virginia Center for Inclusive Communities (Lynchburg chapter), the Free Clinic of Central Virginia, and the Greater Lynchburg Community Trust. He and Marty have four children, one of whom, Bryan, has previously published in Lynch’s Ferry (Spring/Summer 2008).